An electric tool for cutting sheet metal. Used commonly for cutting metal roof sheets and flashings and sheet metal work in general. It works by taking small bites of the material at a time. 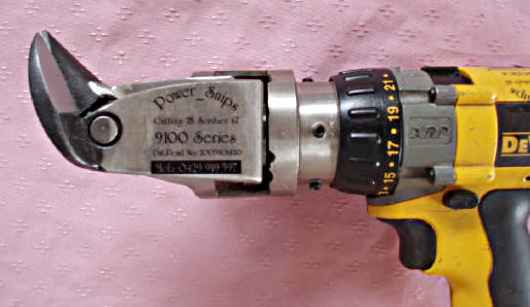 An electric tool for cutting sheet metal. Used commonly for cutting metal roof sheets and flashings and sheet metal work in general. It works by taking a continuous 6mm strip of metal along the cut line leaving two usable pieces. 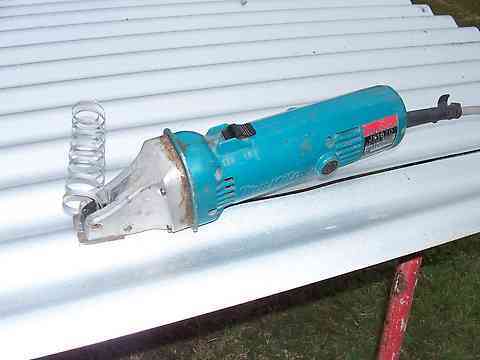 An electric tool for cutting sheet metal. Used commonly for cutting metal roof sheets and flashings and sheet metal work in general. It mimics the action of hand tin snips. These machines work with a reciprocating action and this particular tool called a Power Shears, is used mainly for cutting flat material, although it can handle cutting across low profiles. One of it's main advantages is that it conserves material. 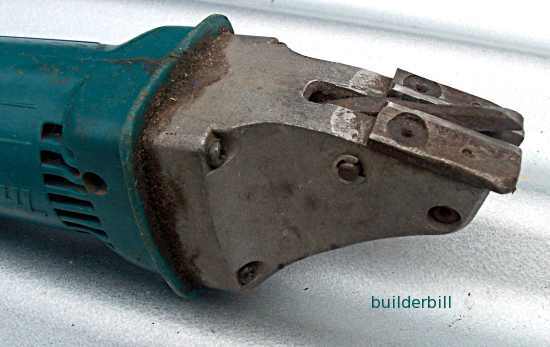 There is very little waste and both cut parts can be used, unlike the Power Snips below. Here is a close up of the business end of the shears. As you can see it is similar to some tin snips, in that it takes a narrow band of material out of the cut, but it leaves both side of the cut straight. This action make the tool very fast in longer cuts. The two stationary arms are known as the anvil and the moving part in the middle of them is the shear. This particular style takes small crescent shaped slice out of the material. 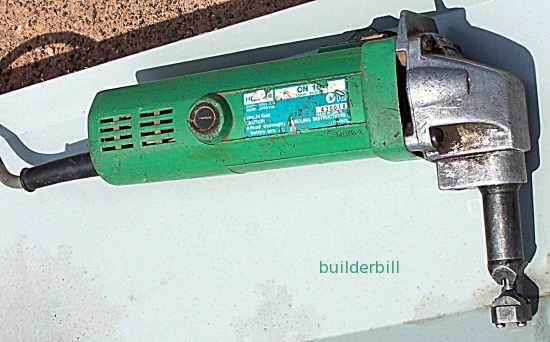 It is designed for cutting arcs and circles and it can also cut straight though deeper roofing profiles the the shears above.It is slower in cutting, but proffessonal roofers seem to get the things cutting quite fast enough in straight lines also. The snips above are discussed in detail on the Power snips page.